Adult Induction Course €25 per person. 1 hour session with instructor. Min 2 people. Junior Club We have changed our Junior climbing sessions on Saturday and Sunday each week. 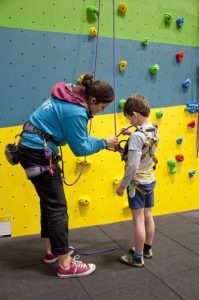 For Juniors who have enjoyed climbing but not sure if they want to enter into a formal instructional programme we run an extended Junior Taster session with a qualified instructor for 90mins of just climbing from 11am to 12.30pm on Saturday and Sundays. This is run at a similar time as the NICAS courses so the juniors can also see what is going on in the instructional classes. All classes, both NICAS and Junior Taster, must be booked in 2 days advance. Call (01) 5582800 for further details.